A primary purpose of fighter aircraft is to destroy other aircraft, either in offensive or defensive modes of operation, or to pose such a compelling threat that enemy air operations are effectively curtailed. Enemy fighters, bombers, patrol and reconnaissance aircraft, as well as ground-support and transport aircraft, are the prey of the fighter. To perform its intended function, the fighter must be able to reach a favorable position for inflicting crippling damage on the enemy. This means that the fighter pilot must first be able to detect the enemy aircraft; the methods of detection employed in the First World War were primarily visual. Thus, the aircraft and pilot's position in it must be designed to provide the widest possible field of view. Detection means little, however, unless the aircraft possesses the performance and maneuverability necessary to achieve a favorable attack position and provides a steady gun platform together with sufficiently powerful armament to destroy the enemy once a favorable position has been achieved. Some of the performance and maneuverability characteristics of importance are speed in various flight conditions, rate of climb and ceiling, roll rate, turning radius and climb capability while in a turn, and range and endurance. Sufficient strength must be provided for the aircraft to survive the loads imposed by high g maneuvers at high speed without structural failure. The ability to sustain a certain amount of enemy fire without  catastrophic damage is another important attribute of the successful fighter aircraft. Adding to the design challenge is the necessity for maintaining structural weight at a minimum, while at the same time providing the required strength and durability. Another important ingredient inherent in a successful fighter aircraft is the manner in which it handles. The flying and handling characteristics of aircraft have been under study for over 60 years and continue to be the subject of investigation as new aircraft configurations evolve and new operating ranges of speed and altitude are encountered. Broadly speaking, an aircraft with good handling characteristics must obey the pilot's control inputs precisely, rapidly, and predictably without unwanted excursions or uncontrollable behavior and without excessive physical effort on the part of the pilot. Preferably, the aircraft should possess these desirable characteristics throughout its performance envelope. Further discussion of handling characteristics is contained in chapter 5. The discussion above outlines in broad terms some of the more important characteristics of the successful fighter aircraft. These desirable characteristics have not changed very much over the years, although they have been more precisely defined. Also, the operating ranges of speed and altitude have changed, as have the weapons and the methods of detection. No aircraft has ever achieved perfection in all areas in terms of the state of the art available in a given time period. Aircraft design involves a compromise between many conflicting requirements. The successful fighter aircraft incorporates the proper blend of compromises that provides the characteristics necessary to counteract the enemy threat in a particular time period and combat environment. The evolution of this rather specialized type of aircraft in the hectic 4-year period of World War I is briefly described next. Discussed and illustrated are 11 fighters that operated over the Western front during this pioneer period of combat aircraft development. The first true fighters to appear in World War I were the Fokker Eindecker series of monoplanes that caused a revolution in the concepts of the way in which a fighting airplane could be employed. The Eindecker was not particularly fast or maneuverable, but it was the first aircraft to effectively employ a fixed, forward-firing machine gun that was synchronized with the engine so that the bullets passed between  the blades of the revolving propeller. The gun was aimed by aiming the entire airplane. This new flying weapon entered combat service in the summer of 1915. Credit for the invention of the synchronized machine gun is a matter of debate among aviation historians, but there is no doubt that the Fokker Eindeckers were the first aircraft to employ this concept in an effective operational sense. Anthony Fokker's version of the invention of the synchronized machine gun and its early use are contained in his autobiography (ref. 50). The results achieved with the Fokkers were spectacular, and the months during which these aircraft reigned supreme are often referred to as the era of the "Fokker Scourge"; Allied aircraft were sometimes called "Fokker Fodder." 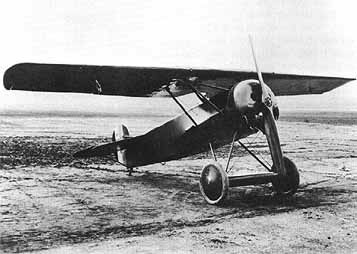 German pilots Oswald Boelcke and Max Immelmann became famous for flying this type of aircraft; Immelmann was killed in one as the result of structural failure in the air. It has never been established whether this failure was caused by enemy gunfire or a design defect. The Eindecker series of aircraft appeared in four versions, E-I to E-IV, with the E-III type produced in the greatest numbers. They were similar in appearance and were equipped with one machine gun, except for the E-IV, which was larger, more powerful, and had two guns. Between 450 and 475 Eindeckers were manufactured. Some of the characteristics of the E-III are given in table I (appendix A), and a photograph of a type E-IV is presented in figure 2.1. 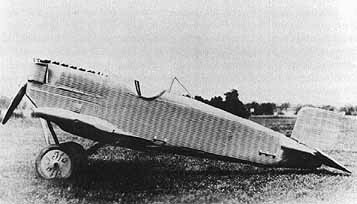 The photograph depicts a fragile-looking midwing monoplane with the wings braced by an array of wires extending from a pylon mounted atop the fuselage to the wing and then down to a complex arrangement of struts that formed the landing gear. The wing itself was quite thin, a common engineering practice through most of the war years. Thick wings were thought, quite incorrectly, to produce prohibitively high drag. It is not known whether this mistaken notion arose because of results obtained from the very low Reynolds number wind tunnels available at that time; or because of poor airfoil design; or perhaps, because birds' wings were thin, designers therefore considered that shape to be the best. 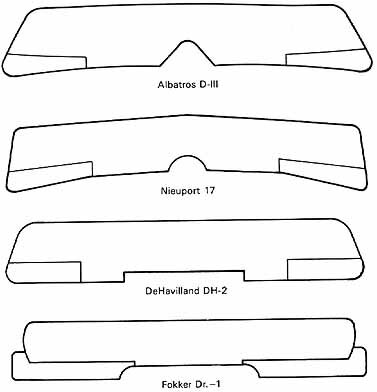 In any case, airfoil thickness ratios of 4 to 6 percent (ratio of airfoil thickness to wing chord) were the norm, and only the Germans successfully applied thick airfoils to wing design later in the war. ...surfaces. The stability and control characteristics of the aircraft were, of course, related to the floating angles of these surfaces as the angles of attack and sideslip of the aircraft varied. The characteristics of the aircraft and the effectiveness of the control system can be judged by the comments of a modern pilot who has flown a replica of the E-III. The late Frank Tallman in his book Flying the Old Planes (ref. 110) says ". . . the major flight characteristic ever present is the feeling that if you took your hands off the stick or your feet off of the rudders, the Eindecker would turn itself inside out or literally swap ends." He also indicates that the all-moving surfaces continually hunted back and forth with an attendant feedback into the pilot's hands and feet. These characteristics describe an aircraft that by modern standards would be considered unpleasant to fly, would be unlicensable, and certainly would inspire little confidence in the mind of the pilot. 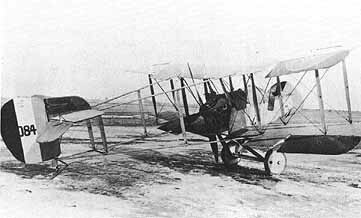 The Eindecker was of conventional frame construction covered with fabric "doped" with glue to stretch it tight and to provide weatherproofing. The wing structure was of wood, whereas the fuselage frame departed from common practice in that it was constructed of welded steel tubing with wire bracing. The E-III was powered with the 100-horsepower Oberursel rotary engine. One of these interesting and unique rotary-type engines is shown in figure 2.2. In order to limit centrifugal stresses, rotary  engines developed maximum power at relatively low rotational speeds, in the range of 1200 to 1400 revolutions per minute. The large diameter propeller on the Fokker E-IV shown in Figure 2.1 was dictated by the low rotational speed of the engine. 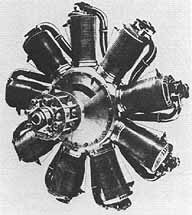 By modern standards, the engines of most World War I aircraft developed rated power at low rotational speed and utilized large diameter propellers. The propulsive efficiency was accordingly high at low speeds, which gave aircraft of that period good takeoff and climb characteristics. A glance at the data in table I for the Fokker E-III indicates a rather light aircraft of 1 342 pounds gross weight with a maximum speed of 87 miles per hour, a high zero-lift drag coefficient of 0.0771, and a low maximum lift-drag ratio of 6.4. Certainly these data do not suggest an aircraft of very impressive performance. Yet, the presence of an effective fixed, forward-firing, synchronized machine gun, which the Allied powers did not have, made the Eindecker the terror of the skies over the Western front in 1915 and secured for it an important place in the annals of World War I aviation history. ...and propeller were simply mounted behind the pilot, which allowed an unobstructed forward field of fire. Several pusher-type aircraft were developed. Typical of this design concept was the DeHavilland DH-2 shown in figure 2.3, designed by Geoffery DeHavilland for the Aircraft Manufacturing Company (AIRCO). The photograph depicts a strut-and-wire-braced, double-bay biplane employing thin, untapered wings. (A brief description of biplane terminology is contained in appendix D.) A small nacelle situated on the bottom wing contained the pilot's cockpit and gun in the forward portion and the 100-horsepower Gnome Monosoupape rotary engine in the pusher position in the rear. The horizontal and vertical tail surfaces were mounted behind the engine on an arrangement of four strut-and-wire-braced outriggers, or booms, which extended rearward from the wings. Cutouts in the trailing edges of the upper and lower wings provided clearance for the rotating propeller, which had four blades to minimize the extent of the cutouts and reduce the required spacing of the outriggers. The smaller diameter four-blade propeller, as compared with a two-blade propeller capable of absorbing the same power, also reduced the length of the landing gear. 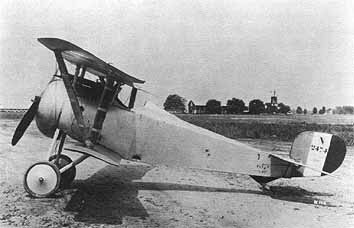 The pusher configuration arrangement of the DH-2 offered excellent visibility forward, upward, and downward to both sides, but a somewhat restricted view to the rear. Armament first consisted of a flexible, forward-firing gun or guns, but this was later replaced by a single fixed gun. 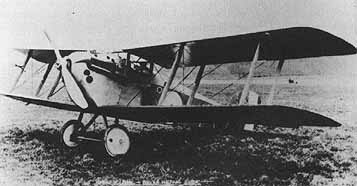 The biplane configuration employed on the DH-2, with detail design variations, was the most frequently used wing arrangements on World War I aircraft designs. The biplane design formula offered the best compromise between structural strength, light weight, and aerodynamic efficiency consistent with the state of the art. The British, as a matter of policy, were not interested in monoplanes because they had a reputation, perhaps undeserved, for structural weakness. 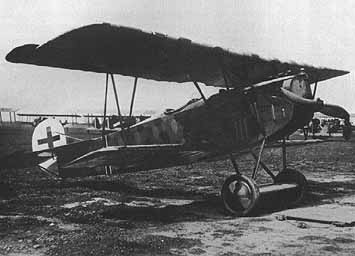 The DH-2 was of wooden frame construction covered with fabric, except for the top and forward parts of the nacelle, which were covered with plywood. Lateral control was provided by ailerons located on both the upper and lower wings, and the tail surfaces had both fixed and movable elements. According to reference 82, the aircraft was sensitive on the controls with a tendency to spin easily. Once they mastered it, however, pilots found the aircraft to be strong, maneuverable, and easy to fly. A comparison of the data given in table I shows that the DH-2 was somewhat faster than the Fokker, was of greater aerodynamic efficiency, and had a significantly lower wing loading. The climbing capability of a fighter aircraft is a very important performance parameter, not shown by the data in table I. Curves showing the time required to climb to various altitudes, based on data given in reference 82, are presented in figure 2.18 for all the fighter aircraft discussed. The climb curves also give the DH-2 an edge over the Fokker. These advantages of the DH-2, together with control characteristics that were no doubt far superior to those of the Fokker, were responsible for the success of the "little pusher." Major Leone G. Hawker, one of the early British aces, commanded the first Royal Flying Corps squadron equipped with the DH-2. While flying one of these aircraft, he was shot down by the German ace Baron von Richthofen flying an Albatros fighter. The DH-2 was a great success when introduced in the spring of 1916 but was outclassed by far superior German fighters by the time of Hawker's death in the late fall of 1916. The aircraft was belatedly withdrawn from combat in the summer of 1917. 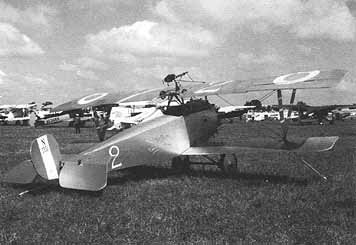 About 400 DH-2's were built. One of the truly great fighter aircraft of the early war years was introduced to combat by the French in March 1916. The Nieuport 17, illustrated in Figure 2.4,.was a development of earlier Nieuport Fighters and was extensively used not only by the French but by the British, Belgians, Italians, and Russians. After entering the war, the United States also employed the aircraft as a trainer. Many well-known Allied aces flew the Nieuport 17: Albert Ball and William Avery Bishop of the British Royal Flying Corps and René Fonck and Charles Nungesser of France exemplify aces who earned at least part of their reputation while flying the Nieuport 17. At the time the aircraft was introduced into combat, a satisfactory gun synchronizing gear was not available, but the deficiency was overcome by mounting a machine gun, which fired over the propeller arc, on the top of the upper wing. This arrangement is employed on the Nieuport 17 replica shown in figure 2.5. Subsequent versions of the aircraft employed the overwing gun in combination with a single synchronized gun firing between the propeller blades, or by a single synchronized gun alone. This later configuration is employed on the aircraft shown in figure 2.4. The Nieuport 17 was a very neat, clean-looking, strut-and-wire-braced biplane powered by the 110-horsepower LeRhone 9J rotary engine. More properly, the configuration of the aircraft should be described as a sesquiplane since the lower wing is of much smaller chord than the upper one. The single-spar lower wing was connected to the upper wing of this single-bay biplane by V-type interplane struts. The small chord of the lower wing provided the pilot with excellent downward visibility, which is the most probable reason for the sesquiplane layout. In earlier Nieuport fighters, the small, single-spar lower wing had shown a tendency toward structural weakness; this deficiency was apparently corrected in the model 17. Lateral control was provided by ailerons on the upper wing only. The tail assembly consisted of an all-moving vertical surface, together with a fixed horizontal stabilizer equipped with a movable elevator. Construction was conventional wood framework covered with fabric, except for the tail which had a steel tube frame. ... maximum lift-drag ratio. The maximum speed was 107 miles per hour at 6500 feet. 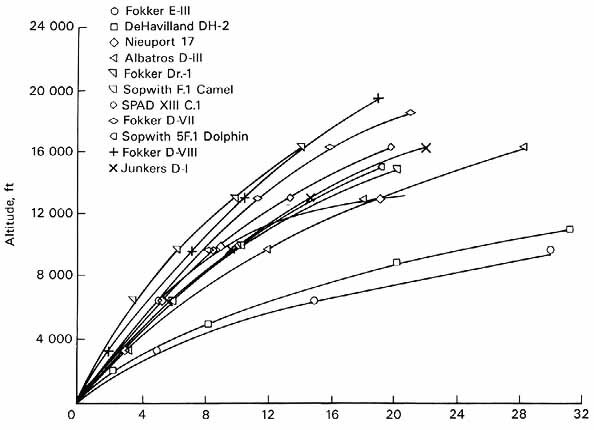 Comparing these characteristics, as well as the climb curves in figure 2.18, with those of the Fokker E-III and the DeHavilland DH-2 leaves little doubt of the superior qualities of the Nieuport 17. According to reference 23, this fighter was so well liked by the Allies that 317 of them were still in front-line service in August 1917-a long operational life for a combat aircraft in an era in which new aircraft were being developed in a matter of months. High on the list of great fighter aircraft of the first world war is the name Albatros. Beginning with the introduction to combat of the model D-I in August 1916, Albatros fighters served in the German Air Force until the armistice in November 1918. 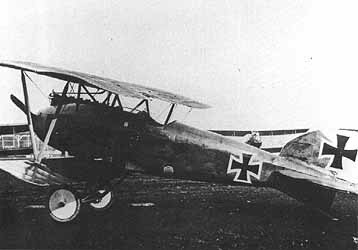 Introduced in January 1917, the D-III and its refined variants the D-V and the D-Va were the best of the Albatros fighters and were produced in the greatest numbers. In November 1917, 446 D-III's and 556 D-V's and D-Va's were in service in combat squadrons with the German Air Force. Air superiority was again in Germany's hands from the late fall of 1916 until midsummer of 1917. So great was the carnage inflicted on Allied aircraft by German pilots flying Albatros fighters that April 1917 is still referred to by aviation historians as "Bloody April." Among the famous German aces who flew Albatros fighters were Manfred von Richthofen, Ernst Udet, Bruno Loerzer, and Werner Voss. Although the name of Richthofen is usually associated with the Fokker triplane, he scored most of his 80 victories flying Albatros fighters (ref. 96). ... the U.S. Navy purchased its last biplane fighter with two forward-firing, synchronized guns in 1938. The Albatros had several structural features worthy of mention. Of particular interest is the fuselage, which was of semimonocoque construction. The term "monocoque" comes from France and means single shell. Thus, the true monocoque fuselage consists of an outside shell, usually formed of plywood, which is held in shape by a number of transverse bulkheads contained within the shell. Louis Bechereau, a French designer, first employed plywood monocoque construction in the fuselage of the 1911 Deperdussion racing monoplane. A semimonocoque fuselage has, in addition to the transverse bulkheads, several longitudinal members to enhance the stability, stiffness, and strength of the structure. This type of construction was strong, rigid, fairly light in weight, and provided a smooth, streamlined shape. In addition, for a given outside diameter, a large usable internal fuselage diameter was available. The smooth, rounded shape of the fuselage of the D-III can be seen in figures 2.6 and 2.7. Interesting details of the semimonocoque type of construction, including many photographs, are given in reference 91. A number of other German aircraft manufacturers utilized this type of fuselage construction during the war years, and it will appear again on some of the racing aircraft of the 1920's (chapter 3) and on the high-performance Lockheed aircraft of the late twenties and early thirties (chapter 4). The wings of the Albatros D-III were of conventional wood-frame construction covered with fabric. As in the Nieuport 17, the lower wing had only a single spar to which the V-type interplane struts were attached. The struts themselves were streamlined steel tubes. Throughout the life of the D-III, D-V, and D-Va designs, despite several modifications, the single-spar lower wing showed an inherent structural weakness that somewhat limited the performance of the aircraft. An examination of drawings of the lower wing (given in reference 91) shows that the single spar was located well behind the quarter-chord point (the approximate location of the aerodynamic center in the chordwise direction). This spar location suggests that the tendency of the wing to fail in high-speed dives was probably the result of aeroelastic divergence, a phenomenon apparently not understood at the time the Albatros fighters were developed. An increase in torsional stiffness or a relocation of the wing elastic axis, or a combination of both, is the usual cure for divergence. A brief description of aeroelastic divergence is given in the discussion of swept wings in chapter 10. Control of the Albatros D-III was provided by ailerons on the upper wings and by an aerodynamically balanced rudder and elevator on the tail surfaces. The fixed portion of the vertical tail was covered with plywood and had elements above and below the fuselage. The tail skid formed an extension of the lower, or ventral, part of the fin. The fixed portion of the horizontal tail, like most aircraft of the period, was not adjustable and thus could not be used to trim the aircraft longitudinally while in flight. Accordingly, a constant push or pull on the control stick was necessary to maintain level flight at a constant speed and altitude. A rudimentary form of longitudinal "trim" system, consisting of a sliding collar on the control stick connected by a hinged link to the cockpit floor, was provided on the Albatros. A thumb-actuated set screw in the collar could be tightened, and the stick was then held in a fixed position; for brief periods, the pilot was then free to use both hands for other activities such as attempting to clear a jammed machine gun. The system is described and illustrated in reference 91. Information on the handling characteristics of the Albatros is limited, but what has been found indicates that it was easy to fly, with no dangerous characteristics. A comparison of the data given in table I for the Albatros D-III and the Nieuport 17 leads to some interesting speculation. Although the D-III was heavier and had more wing area and a more powerful engine than the Nieuport, the values of the wing loading and the power loading for the two aircraft are not greatly different. Furthermore, the values of the zero-lift drag coefficient and the maximum liftdrag ratio are about the same. These two aircraft can therefore be considered to have about equal aerodynamic efficiency and, accordingly, to exhibit about the same performance characteristics. In fact, the maximum speeds given in table I are about the same although the altitudes at which the speeds were measured are somewhat different. Since, for small altitude variations, the decrease in drag that accompanies the reduction in air density is about offset by the reduction in power with altitude, the speed comparison of the two aircraft in the table is valid. Values of the time required to climb to various altitudes are also about the same for the two aircraft at the lower altitudes, as shown by the data in figure 2.18; however, the climbing capability of the Albatros is clearly superior to that of the Nieuport above 10 000 feet. This plus the heavier armament of the Albatros are no doubt responsible for the generally accepted opinion that it was a more effective fighter than the Nieuport 17. Mention of World War I aviation evokes in the minds of many a vision of a brightly painted red triplane handled with consummate skill by the "Red Baron" as he closes for the kill of another Allied airplane. The triplane was, of course, the Fokker model Dr.-1, and the pilot was the great German ace Rittmeister Manfred Freiher von Richthofen. The Fokker Dr.-1 was a manifestation of a design phenomenon that swept the aircraft industry in the period 1917-18. During that time, no less than 34 triplane prototypes were constructed and test-flown in Germany (ref. 69). Other triplane prototypes were designed and tested by countries of the Allied Powers. In today's terminology, all this triplane activity may be classified as an overreaction to the introduction in early 1917 of the British Sopwith triplane. This aircraft, in the hands of a few excellent pilots of the British Royal Naval Air Service, quickly made an enviable reputation as a formidable fighter. Raymond Collishaw was perhaps the best-known British pilot to fly the Sopwith triplane. Less than 75 of these aircraft were employed in combat operations; but so favorable were the reports of German pilots who had fought against the aircraft, as well as those of a few pilots including von Richthofen who had flown captured examples of the triplane, that the German government issued an invitation to industry for the submission of triplane prototypes for evaluation and indicated that production contracts would be forthcoming for deserving designs. Hence, the great triplane fad in Germany. Out of all this activity, the Fokker model Dr.-1 triplane was the only type produced in quantity; approximately 320 were ordered in the summer of 1917. The type was used in combat operations for about 1 year but was employed by a relatively few, elite squadrons of the German Air Force. A Fokker triplane replica is pictured in, figure 2.8. The two wheels visible beneath the tail skid are not part of the aircraft but are attached to a dolly used for towing the aircraft on the ground. The Dr.-1 was a small, light machine equipped with a I 10-horsepower rotary engine and, as indicated by the data in table I, had a gross weight of only 1290 pounds and a small upper wing of 23.7-foot span. ...the first Fokker triplane flew without any interplane struts at all. The wings themselves were cantilever; that is, they obtained their strength entirely from internal bracing. The radical departure of the Fokker Dr.-1 structure from contemporary aircraft design concepts was made possible by the use of wing airfoil sections much thicker than usual at the time. The mistaken notion that low wing drag could only be obtained with thin airfoil sections has been mentioned previously. The Fokker triplane and subsequent Fokker designs proved the incorrectness of the thin wing concept. 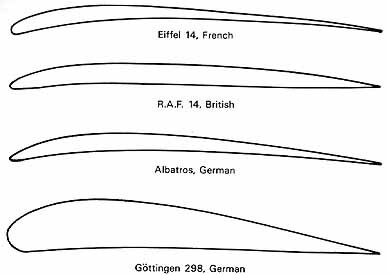 The Gottingen 298 airfoil section of 13-percent thickness ratio, employed on the Dr.-1, is shown in figure 2.9 in comparison with three thin airfoils of the World War I period. These sections were of 4- to 5-percent thickness ratio. Figure 2.9 - Four examples of airfoil sections employed in wings of World War I airplanes. ... scalloped appearance after the fabric had been tightened with dope. 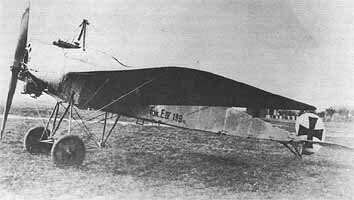 Following standard Fokker practice, the fuselage, tail surfaces, and ailerons were constructed of welded steel tubing. Illustrative drawings of the structural details of the Dr.-1 are given in reference 69. Large horn-balanced ailerons were employed only on the upper wing of the Fokker Dr.-1. The planform of this wing, including the ailerons is shown in figure 2.10 in comparison with upper-wing planform shapes of several of the other aircraft discussed here. The horn balance on the Dr.-1 wing is that portion of the aileron that extends outboard of the wing tip and forward of the aileron hinge line. The purpose of the balances, sometimes informally referred to as "elephant ears," was to reduce the aileron hinge moments, and thus the force that the pilot had to exert on the control stick to roll the aircraft. According to reference 72, the "raked" tips of the other planforms shown in the figure might be expected to have a small beneficial effect on the drag associated with the production of lift. Figure 2. 10 - Wing-planform shapes of four World War I fighter airplanes. ....under the tips of the lower wings and the small winglike fairing that enclosed the axle between the wheels of the landing gear. This fairing became something of a trademark on many later Fokker aircraft. The zero-lift drag coefficient of 0.0323 given in table I for the Fokker Dr.-I was among the lowest of any of the World War I fighter aircraft analyzed, as was the drag area of 6.69 square feet. The maximum lift-drag ratio was a correspondingly high 8.0. The low zero-lift drag coefficient of the Fokker triplane was no doubt due in part to the relatively small surface area of the fuselage in relation to that of the wings. Another important ingredient contributing to the low drag of the aircraft was the absence of the multitude of bracing wires found between the wings on most other aircraft of that period. These wires, or cables, were often of round cross-sectional shape. On the basis of the drag coefficients given in reference 72, the drag in pounds of a  smooth, 0.25-inch-diameter wire at the speeds of World War I aircraft is the same as that of a strut of the same length having a 25-inch chord and an airfoil section of 10- or 12-percent thickness ratio. The wires, intended to take only loads in tension, were, of course, lighter than struts designed for the same purpose. The gain in efficiency associated with a design from which the wires are eliminated is obvious. A good description of the interplane bracing cables employed on the Albatros D-Va is given in reference 91. The speed of 103 miles per hour at 13 120 feet was not particularly high (table I); most discussions of the Fokker Dr-1 in the literature indicate that the aircraft was slow but was highly maneuverable and had an outstandingly high rate of climb. The time-to-climb curves in figure 2.18 indicate a climb performance for the Dr.-I that was far superior to that of the Albatros D-III and the Nieuport 17; in fact, it had a better rate of climb (indicated by the slope of the curve) than any of the other aircraft up to an altitude of between 8000 and 10 000 feet. Unfortunately, these data, taken from reference 82, cannot be considered conclusive since data from other sources, for example reference 119, show much higher times to climb than indicated in figure 2.18. Two sets of climb data are given in reference 69; one set is in essential agreement with the data of figure 2.18, whereas the other is similar to that in reference 119. In an attempt to resolve this discrepancy, the sea-level rates of climb for the Dr.-1 were estimated for several different weights with the use of the methods given in chapter 6 of reference 90. The calculations showed that the climb data in figure 2.18 might have been achievable with a light fuel load, but not with full fuel tanks. The aircraft weight for which the climb data of reference 82 apply is not known for any of the aircraft. The superior climbing capability of the Dr.-1 must be attributed to the thick airfoil sections that allowed operation at the high lift coefficients required for optimum climbing performance, not to the use of three wings instead of two. The triplane fighter of World War I must be considered as something of an aberration in the course of aeronautical development. The design trade-offs and reasoning underlying the concept of such an aircraft are nowhere adequately explained in any of the reference documents. However, one might speculate along the following lines: For a given wing span and area, the effective aspect ratio (related to the drag associated with the production of lift) of a triplane is higher than that of a biplane or monoplane (ref. 103). Or, for a given aspect ratio, the span of a triplane can be less than that of a biplane or monoplane of the same wing area. Thus, the rolling inertia of the triplane can be less  than that of a biplane or monoplane. Greater maneuverability might, therefore, be obtainable with a triplane configuration. Further, the triplane allows the wing area to be divided among three relatively narrow-chord wings, which may be arranged relative to the aircraft center of gravity in such a way as to provide the pilot with better visibility than could be achieved with a comparable biplane. Finally, for a given level of longitudinal stability, the physical distance between the wings and the tail may be reduced on a triplane as compared with a biplane. The quantitative theoretical relationships between the drag-due-to-lift of monoplanes, biplanes, and triplanes were not available in 1916; however, as indicated by references 27 and 79, empirical design data together with qualitative theoretical ideas were available in the literature. The possible and perhaps nebulous advantages of the triplane, however, could not prevail against the increased complication and cost of constructing three wings instead of two and later, when monoplanes were better understood, one. In any event, the Fokker triplane will remain an integral part of World War I aviation lore and will be discussed as long as that era is of interest. And inextricably interwoven with the Fokker triplane story is the name of the highest scoring ace of World War I - the legendary Baron von Richthofen. Discussed next are four fighter aircraft that served with distinction in front-line combat operations until the termination of hostilities in November 1918. Three of these aircraft, the French SPAD XIII and the British Sopwith Camel and Dolphin, were strut-and-wire-braced bi-planes that had a conventional wood-frame structure covered with fabric. The fourth, the German Fokker D-VII biplane, had internally braced cantilever wings like the Fokker triplane, together with a typical Fokker welded steel tube fuselage. ...covered a portion of the guns, which gave the fuselage a humped appearance when viewed from the side. This hump coupled with the large dihedral angle of the lower wing and the flat upper wing are allegedly responsible for the name "Camel." The aircraft first began combat operations in July 1917 and was a front-line combat aircraft until the armistice in November 1918. Camels accounted for the destruction of more enemy aircraft than any other Allied fighter of the war - a total of 1294. Production of the Camel amounted to 5490 aircraft. The flat upper wing of the Camel was dictated by a desire for production simplicity. The original intention was to construct the wing in one piece, although in production it was made in three pieces. The dihedral of the lower wing was accordingly made sufficiently large to compensate for the flat upper wing. The Camel utilized a relatively new innovation in wing-bracing wires. From a study of references 100 and 110 and an examination of detailed drawings of the Sopwith Dolphin, streamline wires were used for bracing on both the Camel and the Dolphin. (Streamline wires have a cross-sectional shape much like a symmetrical airfoil section.) Such wires were developed by the Royal Aircraft  Factory at Farnborough, England and were first flown experimentally on the SE-4 in 1914 (ref. 39). 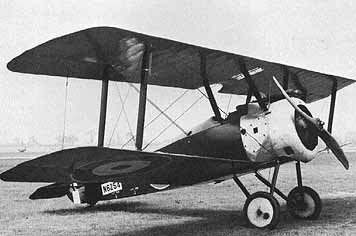 The Sopwith Pup and triplane, both of which entered service in 1916, also had streamline bracing wires. The advantage in drag reduction of using this type of wire rather than the usual round wire is great; there is a factor of about 10 between the drag coefficients of the two types of wire. Yet, no significant use was made of this improved type of wire during the war except by British aircraft manufacturers. Because streamline wire was first developed at Farnborough, it was known as Rafwire. The Camel was produced with a number of different power plants of varying horsepower; the greatest number of aircraft, however, had the Clerget 9B nine-cylinder rotary engine of 130 horsepower. Characteristics of the Sopwith F.1 Camel equipped with this engine are given in table I. The Camel was a small, relatively light aircraft with a gross weight of only 1482 pounds. Its maximum speed of 105 miles per hour at 10 000 feet was not particularly fast, and its zero-lift drag coefficient and maximum lift-drag ratio do not suggest a very outstanding aircraft. The climb data given in figure 2.18 show that the Camel performed better than the Albatros D-III, but not so well as some of the other aircraft for which data are shown. All the reference literature, however, credit the Camel with having superb maneuverability. 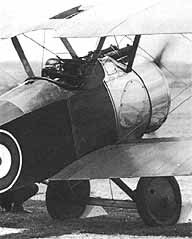 Some of the agility displayed by the Camel is usually attributed to the Sopwith practice of locating the concentrated weights in the aircraft-pilot, engine, guns, and fuel-in close proximity to each other. Thus in the Camel the pilot's feet were beneath the rear components of the engine, the guns were over his legs, and the fuel tank was immediately behind his back in the fuselage. Some idea of the bunching together of these elements around the pilot is suggested by figure 2.12, where a present-day pilot is shown -sitting in the cockpit of a Sopwith Camel replica. Certainly, the pilot was not seated in a very favorable position to withstand the effects of a serious crash. ....provides an example of these characteristics. Based on the information contained in appendix II of reference 100 for the later Sopwith Snipe, the gyroscopic action of the engine caused a nose-up moment in a left turn and a nose-down moment in a right turn. Accordingly, left stick, a large amount of left rudder, and moderate back stick were required in a steep left turn; too much back stick caused the aircraft to stall and spin. Right stick, a moderate amount of left rudder, and full back stick were required in a steep right turn. There seems little doubt that these odd control techniques could cause confusion and indecision on the part of an inexperienced pilot. The Sopwith Camel has been called the most loved and the most hated aircraft of World War I loved by those who mastered it and exploited its peculiarities and hated by those who did not. The outstanding dogfighting capability of the Camel together with the record number of German aircraft it destroyed give it an honored place in the World War I aircraft hall of fame. If this were not enough, one version of' von Richthofen's last fight has a relatively obscure Canadian ace, Captain A. Roy Brown, shooting down the famous baron while flying . . . a Sopwith Camel. SPAD was the acronym of the French aircraft company Societé pour Aviation et les Derieves, headed by famed aviation pioneer Louis Bleriot, which produced a line of highly successful fighter aircraft in World War I. The SPAD model XIII C. 1 is the subject of the following discussion. The SPAD XIII descended from the earlier model VII which first entered combat in the fall of 1916. In contrast to the earlier aircraft, the model XIII was somewhat larger, had a more powerful engine, and was equipped with two synchronized machine guns rather than one. It entered combat in the fall of 1917 and served with the air forces of most of the Allied Nations, including the United States. Many famous aces flew the SPAD, but to Americans the best known was Captain Edward V. Rickenbacker, the top scoring U.S. ace of the First World War. 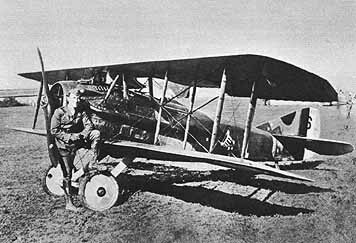 A SPAD XIII in the markings of the 94th Pursuit Squadron of the American Expeditionary Force is shown in figure 2.13; the officer shown is Captain Rickenbacker. Figure 2.13 depicts a stubby but graceful-looking biplane with wings of equal chord and span, configured with no stagger and relatively small gap. The small gap in combination with the center cutout of the upper wing gave the pilot excellent visibility over the top of the wing. The design appears to be that of a double-bay biplane; however, the inner struts served only to stabilize the rather long wing-bracing wires and prevent their flapping and chaffing (ref. 22). The wires themselves consisted of round cables. The cockpit was close behind the engine with the pilot's feet and part of his legs located in aluminum tunnels beneath the engine (ref. 110). The landing gear was positioned well forward, ahead of the center of gravity, to minimize the risk of a nose-over on landing. Ailerons were on the upper wing only, and, as with the other aircraft described, no means of longitudinal trim was provided. The SPAD XIII was powered with the Hispano-Suiza 8BA engine of 220 horsepower. The engine had eight water-cooled cylinders in two banks of four arranged in a V-type configuration, much like that of many modern automobile engines. The distinctive round radiator, equipped with manually operated (from the cockpit) shutters for controlling the cooling airflow, may be seen in figure 2.13. Long exhaust pipes ran on either side of the fuselage and terminated behind the pilot's cockpit. This arrangement resulted in a relatively quiet environment for the pilot (ref. 110). In an interesting survey of aircraft piston engine development, Taylor (ref. 111) credits the Hispano-Suiza with being one of the best and most advanced engines of World War I, as well as one that served as a sort of progenitor for a long line of Curtiss and Rolls-Royce liquid-cooled engines that culminated in the Rolls-Royce Merlin of World War II. The data in table I indicate that the SPAD XIII had the most favorable power loading of any of the aircraft considered and a high (for its day) wing loading. These characteristics coupled with a relatively low zero-lift drag coefficient and low drag area gave the SPAD the highest speed of any of the aircraft listed in the table. As shown by the data in figure 2.18, the climb characteristics of the SPAD were bettered only by three of the Fokker aircraft. The reference literature suggests that the SPAD XIII was not as maneuverable as some of the other fighters, but its high performance, great strength, and multigun armament made it a highly effective weapon. Its ability to dive steeply for prolonged periods of time without fear of structural failure is emphasized in all the reference material. Piloting the aircraft required care, particularly at low speeds, and the use of moderate amounts of power was recommended in landing. Although the SPAD XIII incorporated no new technical innovations, it synergistically combined an airframe of relatively high aerodynamic efficiency and great structural strength with an excellent engine to produce an outstanding aircraft. It may be regarded as representative of the top of the state of the art of a 1918 fighter aircraft equipped with thin, strut-and-wire-braced wings. The SPAD was so highly regarded that a number of countries maintained the aircraft as part of their active air force inventory for several years following the war. A total of 8472 SPAD XIII aircraft were manufactured. In the early 1970's, the U.S. Air Force announced with much fanfare a flyoff competition between prototypes of a new lightweight fighter aircraft. The resulting competition involved several years of research, engineering, and detailed flight evaluation before a winner was announced, the General Dynamics F-16. There was no novelty about the Air Force's prototype competition; it is a time-honored method of selecting military aircraft. The date of the first such competition is unknown, but one of the most renowned of German World War I fighters, the Fokker D-VII, was selected for full-scale production after being chosen the winner from about 30 competing prototypes. The time was late January 1918, and the place was Aldershof Airfield near Berlin. As an indication of the speed with which prototype fighter aircraft could be developed at that time, Fokker alone entered no less than nine different types. Each of the competing aircraft was demonstrated by the manufacturer and then evaluated by well-known front-line pilots. The Fokker D-VII was the unanimous winner of the competition and first entered combat in April 1918 - an indication of the rapidity with which the unsophisticated aircraft of that era could be developed from prototype to combat readiness. Over 800 model D-VII aircraft were in front-line operations by mid-August 1918. ....responsible for many of the fine characteristics of the aircraft. The ailerons, located on the upper wing only, as well as the elevator and rudder had horn balances to reduce control forces. The winglike fairing between the wheels is also evident in figure 2.14; one experimental version of the D-VII had a fuel tank located in this fairing to reduce the fire hazard. The production aircraft was powered with either a Mercedes 160-horsepower engine or a BMW 185-horsepower engine. Both engines were six-cylinder, in-line, water-cooled types. The BMW- was the preferred engine, however, as the aircraft proved to be somewhat underpowered when equipped with the Mercedes (ref. 112). The Fokker D-VII was the heaviest of the fighters considered here and had wing loading and power loading values greater than those of the SPAD X111. The power loading was in fact no lower than that of the Sopwith Camel, and the wing loading was higher. On the basis of these comparisons, the climb performance of the D-VII might be expected, according to the relationships given in chapter 6 of reference  90, to be inferior to that of both the SPAD XIII and the Sopwith Camel. On the contrary, the data in figure 2.18 show the D-VII to have much better climb performance then either of the other two aircraft. Brief calculations of the sea-level rate of climb by the methods in reference 90 indicate that the climb data for the Fokker D-VII are reasonable but that the SPAD should have had much better climb performance than indicated in figure 2.18. The explanation can no doubt be attributed, as mentioned for the triplane, to the thicker airfoil sections employed in the wings of the D-VII. The climb analysis showed that the maximum rate of climb could be achieved at lift coefficients of about 1.1 and 1.0 for the Fokker and the SPAD, respectively. The thick-wing D-VII could probably be flown with comfort at the required lift coefficient for maximum rate of climb, whereas the SPAD most likely could not. In fact, a lift coefficient of 1.0 might have been beyond the maximum value achievable by the SPAD XIII with its thin wings. In other respects, the performance of the Fokker D-VII was good but not outstanding. The maximum speed of 124 miles per hour was not as high as that of the SPAD. This would be expected since the ratio of power-to-drag area was lower for the Fokker. The value of the maximum lift-drag ratio of the D-VII, however, was about 10 percent higher than that of the SPAD, which can be attributed to the higher aspect ratio of the Fokker wing configuration. Not expressed by the data in table I were the superb handling characteristics that all the reference documents attribute to the Fokker D-VII. The aircraft was highly responsive, with light control forces; yet, unlike the Camel, it had no vices or contrary tendencies, and it could be flown with confidence throughout its flight envelope. Hence, the aircraft could be handled competently and safely by relatively inexperienced pilots and superbly by experienced ones. Frank Tallman clearly regarded the D-VII as the most outstanding of the World War I fighter aircraft he had the opportunity to fly (ref. 110). Perhaps the greatest tribute to -the D-VII can be found in article IV of the armistice agreement, which lists war material to be handed over to the Allies and specifically mentions all aircraft of the D-VII type - the only aircraft to be specifically cited in the armistice agreement. Certainly, this was a strong endorsement of the capabilities of the young Dutch designer, test pilot, and entrepreneur Anthony Herman Gerard Fokker, who provided the German Air Force with so many excellent aircraft . . . after being told by the Allied Powers that his services were not wanted (ref. 50). The wing arrangement of the Dolphin was dictated solely by a desire to give the pilot improved visibility in the forward, upward, and rearward directions. Following the usual Sopwith practice of locating the concentrated masses in close proximity to each other, the pilot was positioned immediately behind the eight-cylinder Hispano-Suiza engine, with his feet actually resting on the rudder bar beneath the rear part of the crankcase. As in the Camel, the fuel tank was in the fuselage immediately behind the cockpit. To overcome the poor visibility of the Camel, the top wing of the Dolphin was located close to the fuselage so that the pilot's head protruded through a large cutout in the wing near the leading edge; this cutout can be seen in figure 2.15. Positioning the aerodynamic center in the proper relation to the aircraft center of gravity made it necessary to place the lower wing ahead of the upper wing, which was located relatively far back from the nose. The negative stagger configuration was the result. ...protruded into the cockpit. (The flexible guns are not mounted on the aircraft shown in figure 2.15.) Understandably, pilots were not entirely happy when posted to squadrons equipped with the Dolphin. Various methods of protecting the pilot in case of an accident, including "roll bars," were investigated, but no such device was universally incorporated on production aircraft. The first prototype Dolphin had a radiator located in front of the engine, automobile style, but this installation greatly restricted visibility in landing. The single nose radiator was then replaced with two small radiators located on either side of the fuselage, just to the rear of the cockpit. These radiators can be seen in figure 2.15. The pipes connecting the radiators to the engine passed through the cockpit on each side. One Dolphin pilot described how the pipes were used as "hand warmers" during flight at high altitudes. While the control stick was held with one hand, the other glove-encased hand grasped the water pipe until it was warm, after which the pilot flew the aircraft with the warm hand while holding the pipe on the opposite side of the cockpit with his other hand (so said the late Charles E. Walton, formerly of No. 23 Squadron of the Royal Air Force, in conversation with the author). Such a story becomes believable in view of the temperatures of 0°F and below encountered at altitudes of 15 000 feet and above, even on warm summer day. According to the data given in table I, the Dolphin was a large, heavy fighter with a gross weight of 1911 pounds and a wing area of 263 square feet. The maximum speed was a very credible 128 miles per hour at 10 000 feet but was somewhat less that that of the SPAD. 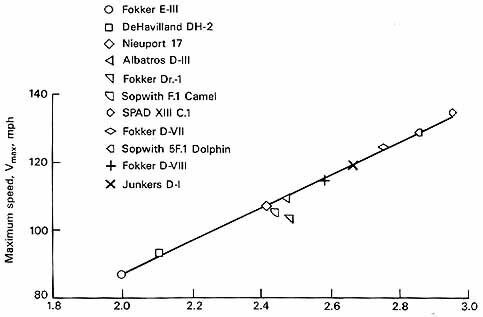 The climb results in figure 2.18 show a performance improvement of the Dolphin at the higher altitudes, as compared with the Camel, but the Dolphin was inferior at all altitudes to the SPAD XIII and the Fokker D-VII. Most references to the Dolphin allude to its excellent high-altitude capability, but the results shown do not support this contention. Data in reference 31, however, show a much improved climb capability when later versions of the aircraft were equipped with a more powerful 300-horsepower engine. The flying qualities of the aircraft apparently had no treacherous tendencies but were characterized by fairly heavy control forces and relatively slow response. The Dolphin first flew in June 1917 and entered combat in squadron strength in January 1918. A total of 2150 Dolphins were ordered, but only 1532 were delivered by the end of the war. Not many combat squadrons were equipped with the aircraft. That the Dolphin was thought well of is indicated by the expressed intention of the French to build under license a 300-horsepower version of the aircraft for use by their air force. The German Air Force sponsored another flyoff fighter competition at Aldershof in June 1918. Twelve companies entered 25 prototypes; of these, 5 were Fokker monoplanes. 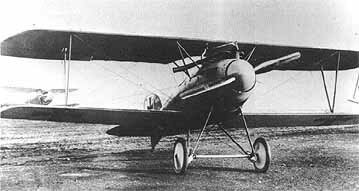 The Fokker D-VIII monoplane was the overall winner, and a production order was placed for 400 of them. A second aircraft, the Junkers D-I, also received a limited production contract. Both of these aircraft arrived on the scene too late to make any sort of reputation in combat, but both are included in the present discussion because of their technical significance. The Fokker D-VIII and the Junkers D-I are shown in figures 2.16 and 2.17, respectively. ...full cantilever. Unlike the earlier aircraft, however, the D-VIII wing was covered entirely with plywood, which gave it great strength and rigidity. Also, it was one of the few wings of the World War I period to be tapered in both planform and thickness ratio. Wing taper not only increases aerodynamic efficiency but also structural efficiency, especially for a cantilever wing, since taper reduces the wing weight and rootbending stress for a given wing area. Wing damping in roll is also reduced by wing taper; this means a higher rate of roll for a given aileron-supplied rolling moment. The D-VIII wing, scaled to various sizes, was used on Fokker aircraft for many years (ref. 38). The fuselage and tail structure were of typical Fokker design and consisted of welded steel frames covered with fabric. Power was supplied by an Oberursel rotary engine of 110 horsepower, which was the same engine that powered the earlier Fokker triplane. At 1238 pounds, the gross weight of the D-VIII was slightly less than that of the triplane and about the same as that of the Nieuport 17. The maximum speed of the D-VIII was a modest 114 miles per hour at 6500 feet, but the climbing capability of the aircraft, shown by the data in figure 2.18, was outstanding. As discussed in connection with the triplane and the D-VII, the superb climbing performance of the D-VIII was due in large measure to the thick airfoil sections utilized in the wing. The small wing area with respect to the fuselage and tail area is partly responsible for the high zero-lift drag coefficient of 0.0552. Other important contributors to the high drag coefficient are the complex arrangement of cabane struts, fixed landing gear with large unstreamlined wheels, and open cockpit. Truly low drag coefficients can only be achieved when, in addition to cantilever wings, all these other drag-producing elements are eliminated and very careful attention is given to detailed design and refinement. This synergistic combination was finally achieved in the time period between 1930 and 1940. (See chapter 4.) To put the drag coefficient of the D-VIII in perspective, the value of this coefficient for a modern general aviation aircraft, the Beech Bonanza, is 0.0192. Although the Fokker D-VIII is of technical interest because of its wing design, the data do not seem to indicate that the aircraft represented any significant improvement over the D-VII. The 145-horsepower Oberursel rotary engine was intended as a replacement for the 110-horsepower unit but was not manufactured in sufficient quantity to allow its use on production aircraft. Flight tests of an experimental model of the D-VIII equipped with the larger engine showed much better performance than indicated by the data in table I. Figure 2.18 - Time required to climb to various altitudes for 11 world War I fighters. No discussion of the Fokker D-VIII would be complete without mention of the structural problem encountered with the wing. Some 20 aircraft were delivered in late July" 1918, but in a fairly short time; several were lost in flight as a result of structural failure of the wings. Although some disagreement as to the cause of these failures can be found in the literature, the account given by Fokker in his autobiography (ref. 50) seems reasonable. According to his account, the technical department of the German Air Force required that the rear wing spar of the production aircraft be strengthened to conform with design rules established for aircraft with conventional strut-and-wire-braced wings. In modern terminology, the elastic axis of the cantilever wing (the chordwise location of the axis about which the wing twists) was moved rearward, with the result that the wing diverged, or twisted off, at a certain critical speed that varied with altitude. (See chapter 10.) Once the wing design reverted to the original rear spar size, the elastic axis  was moved forward and no further difficulty was encountered. Wing divergence and flutter are well understood today but were something of a mystery for many years. An understanding of these phenomena is particularly important in the design of structurally sound cantilever wings. Such wings were regarded with grave suspicion for a long time because of problems such as those encountered with the D-VIII and other aircraft having cantilever wings. 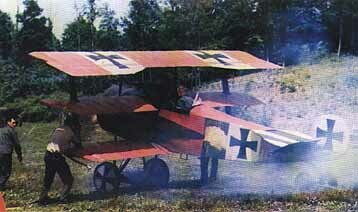 The Fokker D-VIII returned to combat operations in October 1918, and 85 were in use at the time of the armistice. A total of 381 examples of the aircraft, known informally as the Flying Razor, were delivered. The configuration of the Junkers D-I monoplane fighter (fig. 2.17) was modern in appearance and featured a thick, full cantilever wing mounted in the low position at the bottom of the fuselage. Although not apparent in the photograph, the wing tapered in thickness ratio from approximately 17 percent at the root to about 12 percent at the tip, but was untapered in planform. The airfoil thickness ratio at the root was greater than that of any of the airfoil sections employed on the Fokker fighters. Other features to note on the aircraft are the 185-horsepower BMW engine with nose-mounted radiator, the all-moving vertical tail, and the roll bar located behind the cockpit to protect the pilot's head if the aircraft nosed over onto its back. The durability of the all-metal structure was one of its most attractive attributes. The types of cloth with dope finishes used on most World War I aircraft deteriorated rapidly, apparently a result of light of certain wave lengths in the Sun's spectrum. A great deal of study was given to finding means for protecting aircraft covering. Certain types of dope or paint were found to offer more protection from the Sun than others (ref. 39). Wooden wings, such as employed on the D-VIII and later Fokker designs, were subject to delamination, rot, and deterioration  of glue joints. All these factors highlighted the advantages of all-metal construction, although the strut-and- wire-b raced biplane covered with fabric continued, at that time, to give the lightest weight for a given strength. The Junkers D-I had a relatively high zero-lift drag coefficient of 0.0612, due in part to reasons similar to those outlined for the Fokker D-VIII. In addition, the corrugations in the covering increased the wetted area (the surface area exposed to the airstream) by 20 to 40 percent (ref. 72); this increase is not accounted for in the conventional method of defining the drag coefficient. The maximum lift-drag ratio was a poor 7.0, which compares quite unfavorably with the value of 8.1 for the Fokker models D-VII and D-VIII, and 9.2 for the Sopwith Dolphin. The maximum speed quoted for the D-I varies from 115 to 149 miles per hour depending upon the reference consulted. A value of 119 miles per hour is listed here and is thought to be close to the maximum speed achieved. The climbing performance of the aircraft was about the same as that of the Sopwith Dolphin. The advantages of the thick wing apparently could not overcome the disadvantages of the high wing loading, high power loading, and the high zero-lift drag coefficient. Forty-one Junkers D-I fighters were built, but apparently none saw combat service. By the end of World War I, the fighter airplane had progressed from a flimsy, low-performance, and clumsy vehicle to a highly effective aircraft. Many configuration types were tried in combat, but the strut-and-wire-braced biplane equipped with two synchronized machine guns firing between the rotating propeller blades set a pattern in fighter design that lasted until the mid-1930's. Although the thick cantilever wing was successfully employed by Fokker, the concept was not widely used until the monoplane fighter became the standard configuration type just prior to World War II. Engine power and reliability increased during the World War I period, as did aircraft structural strength and reliability. Detailed aircraft stress analysis, unusual in 1914, had become common design practice by 1918, and a fairly comprehensive body of aerodynamic data was available to the designer. Aircraft control and handling characteristics, though largely a matter of cut-and-try experimentation, also greatly improved during the 4-year period. Aircraft performance improvements can easily be shown in a quantitative way by graphical means. The large improvements in climbing performance have already been discussed with the use of the time-to-climb curves given in figure 2.18. A more favorable relationship between the wing loading and power loading together with higher aerodynamic efficiency were responsible for much of the improved climb performance realized from 1914 to 1918. The importance of the thick airfoil sections employed by Fokker and Junkers in allowing the aircraft to climb at its optimum lift coefficient has also been indicated. where Po is the maximum power available at sea level, f is the drag area, is the atmospheric density ratio for the given altitude, and is the percentage of maximum sea-level power available at that altitude. The values of both and were obtained from reference 90. The method of presenting the speed data assumes that the drag due to lift is a small fraction of the total drag for the maximum-speed flight condition and that the propeller efficiency is about the same for the different aircraft. The near linear correlation of the data in figure 2.19 shows these to be good assumptions in most cases. In the 4-year period of World War I, the maximum speed of fighter aircraft increased from 87 to 134 miles per hour - or expressed another way, the maximum speed increased by 54 percent. This increase in achievable maximum speed resulted from a reduction in drag area, that is, more efficient aerodynamic design, and from increased engine power. Figure 2.19 - Variation of maximum speed with power parameter H.
(a) For sea level conditions. In comparing the values of the two aircraft, the SPAD has over twice the power but only 65 percent of the drag area of the Fokker. The quest for high performance has always been exemplified by vigorous efforts to increase both aerodynamic efficiency and power. For example, the drag area and power of the World War II North American P-51 fighter (chapter 5) were 3.75 square feet and 1490 horsepower, respectively. The corresponding value of was 7.35. Compare these numbers with those for the Fokker and the SPAD! Aircraft structural efficiency is also of great interest and can be thought of in terms of the minimum weight structure needed to meet required strength and stiffness criteria. Simple methods of adequately illustrating trends in structural efficiency are difficult to define. One fairly simple but relatively crude approach was presented by Wilson in reference 122 and was later used in reference 90. Correlations in reference 122, augmented by the present writer with a great deal of new data, show that the sum of the weights of the payload, fuel, and propulsion system tends to be nearly a constant fraction of the gross weight in well-designed aircraft regardless of the method of construction or era in which the aircraft was designed. Put another way, the useful load fraction 1-(We/Wg) should correlate closely with the engine weight fraction Wt/Wg, where Wg, is the gross weight, We, is the empty weight, and Wt is the propulsion-system weight. 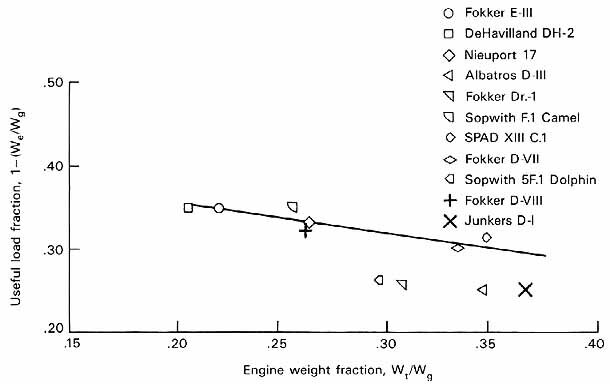 Figure 2.20 - Aircraft useful load fraction as junction of engine weight fraction. increased by 10 percent to account for the weight of the radiator and associated plumbing system and the cooling water. Seven of the aircraft show a close correlation between the useful load and engine weight fractions. A relatively consistent level of structural efficiency is accordingly suggested. Four of the aircraft, however, show values of the useful load fraction significantly below the straightline fairing through the data for the other aircraft. The four aircraft with reduced structural efficiency were the all-metal Junkers D-1, the Albatros D-III with its semimonocoque wooden fuselage, the Fokker Dr.-I with its three wings, and the Sopwith Dolphin. The reduced values of useful load fraction are perhaps explainable by unique features incorporated in three of these aircraft, but there seems to be no clear reasons for the high empty weight of the Sopwith Dolphin. This discussion of design and performance trends concludes the section on World War I fighter aircraft. Attention is now focused on multiengine bombers of that era.